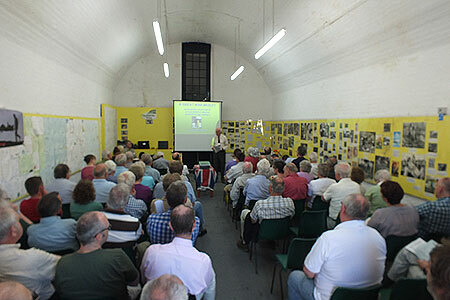 I had the honour of being invited to speak at the Sussex Military History Society 'Land, Air & Sea' 2012 Study Day at Newhaven Fort on May 26. This was the Society's second study day and this year's chosen charity was Help for Heroes; a full report will appear on the Sussex Military History Society website in due course. Newhaven Fort was the ideal location; on such a hot sunny day, the cool interior of a Victorian casemate provided a comfortable atmosphere for a capacity audience of 80 military history enthusiasts. First on was Geoff Bridger with an amusing insight into some lesser-known aspects of the Great War. He was followed by aviation historian Andy Saunders who delivered a fascinating description of the events of Friday August 16th, 1940 from a Sussex point of view. Visitors then enjoyed Ed Tyhurst's tour of the fort before the day was rounded off by the Navy, with Simon Bellamy analysing the Channel Dash of 1942. I was the penultimate speaker and did my The Battlefield Beneath Your Feet talk, covering three phases of construction of anti-invasion defences in East Sussex 1940-42. What the audience was not aware of, was how close I was to not being able to do the talk! As I use Google Earth and can't always rely on having an internet connection, I have to hope that the relevant imagery has cached on my laptop. Unfortunately, it hadn't. I was lucky to discover this the day before during set-up and rehearsal. 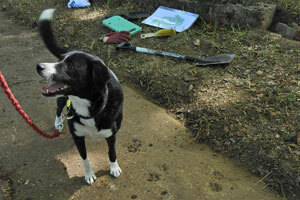 The day was saved by the Fort's staff, who gave me access to an internet connection and after a couple of minutes, I was all ready to go. The talk otherwise went pretty much as rehearsed. The rest of this post is related to material I covered or responses to questions asked on the day. 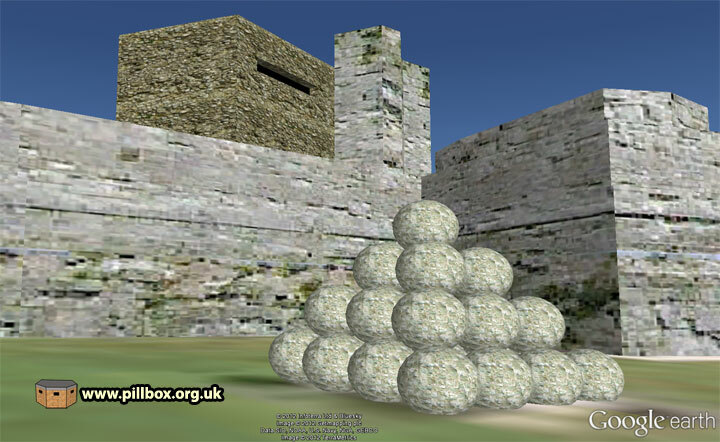 During the Q & A following my talk, I was asked what the difference was between cubes, buoys, pimples, cylinders and coffins; take a look at the Pillboxopedia column at right for an explanation. 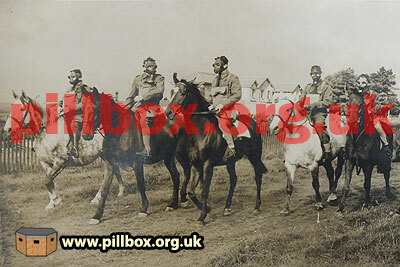 My description of the final phase of anti-invasion defences made reference to a mounted unit of the local Home Guard battalion. 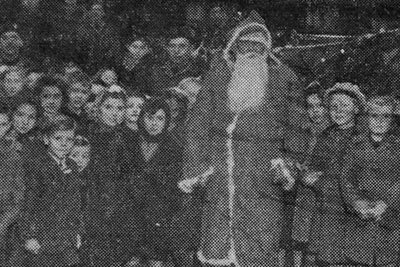 Had I been able to have found this photo sooner, it would have been included in the talk. I got this photo from one of the men who actually appears in it, whom I had the pleasure of interviewing a few years ago. 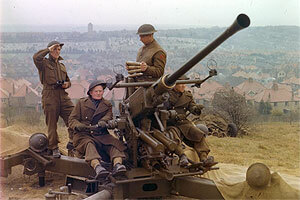 The importance of this unit is demonstrated by the fact that it was the largest such Home Guard mounted squadron in Britain - and was increasing in strength at a time when other such outfits elsewhere in the UK were being disbanded. As it covered a large gap on the right flank, the Canadian Army actually subsidised it, supplying fodder and such equipment as was required. 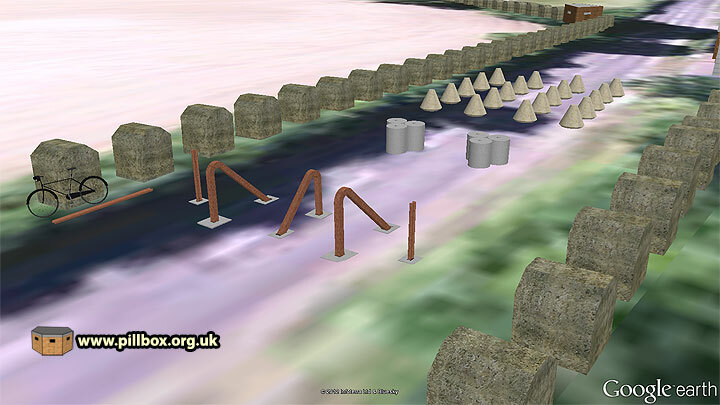 I also described how anti-tank ditches fitted into the scheme of things; I had some queries about a section of dredged ditch running from Hailsham - Bexhill - Langney; I wrote about this back in November 2007. 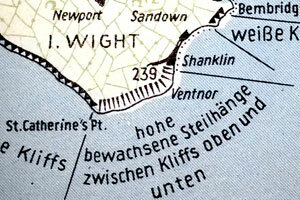 A map of its course is shown below. 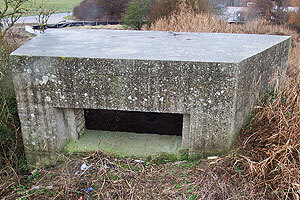 Below is a dummy pillbox; very few of these were erected as there were so many real pillboxes that some of these were used as decoys in their own right. In order to squash more material into the talk, the Cuckmere Haven fly-through was much edited from its previous ten-minute slot. I cut out the Exceat Bridge locality and the northern pillboxes and only glossed over the beach defences. 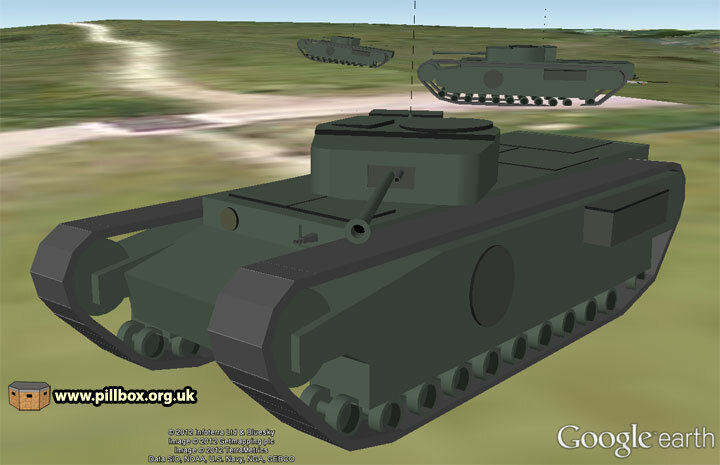 I did, however, add in some 2-pounder anti-tank guns, so the model is still being developed and improved. It's almost become a Bohemian Rhapsody in that no matter what I do from now on, it will always be asked for and prove popular; this is why I've crammed other subjects and areas into the talk to avoid any one part becoming a centre-piece. The video is long overdue for revision, so I may post a brand new version in the near future; this edition doesn't include the minefields, the rear localities or anti-tank guns. Some of the other areas I covered in the talk may also be added as videos in due course. If any other issues arising from the Study Day become apparent, I'll update this post; so if you were there on the day and have any further questions, please let me know! Ditch designed to hinder movement of tanks and AFVs. Ditches could be entirely artificial or existing ditches or natural features such as rivers, might be dredged, shaped and revetted to improve their effectiveness. Small concrete roadblock obstacle comprising a truncated cone with domed base. A hollow shaft down the centre allowed the buoy to be manhandled using a crowbar. Buoys were deemed of little value by 1941 and cylinders seen as a better solution. An irregularly-shaped anti-tank obstacle, triangular in section and increasing in height from front to rear. Complex and time-consuming to produce, coffins were rendered obsolete by 1941. The term is occasionally incorrectly applied to buttresses and a distinctive style of cube seen in Sussex. Anti-tanks blocks, popularly known as dragon's teeth. Not to be confused with smaller blocks known as pimples, cubes can be upwards of 1m square. Many examples in Sussex have apexes or chamfered edges, leading to them being incorrectly recorded as coffins. Reinforced concrete cylindrical obstacles with a shaft down the centre in which could be inserted a crowbar for manhandling, or a picket for barbed wire. Cylinders were 90cm high and 60cm wide and deployed in groups of three as a more effective alternative for buoys. 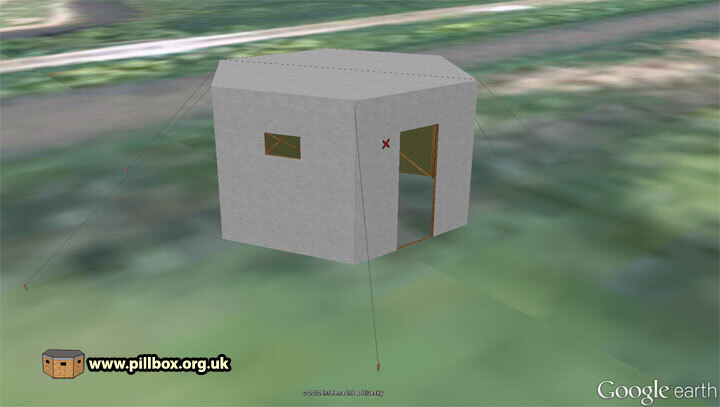 Defended road junction(s), usually within a village/town with a Home Guard garrison intended to deny enemy use of the roads. 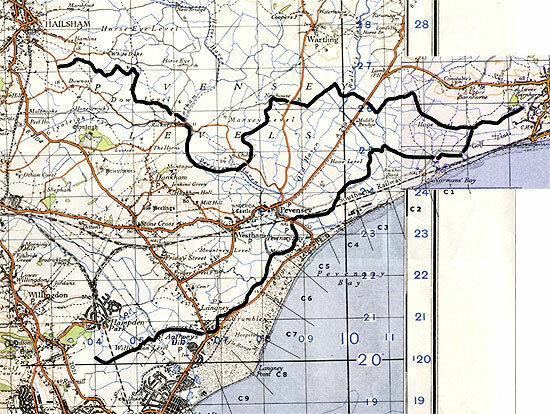 Nodal Points were not to defend the village, but solely the road network. Category 'A' Nodal Points were to hold out for 7 days after invasion without outside assistance.